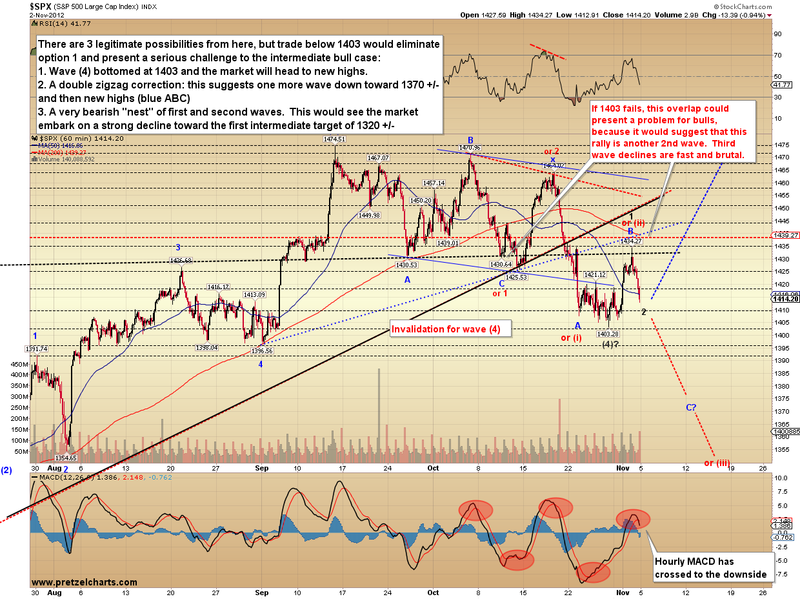 Last week the market gave several buy signals, but Friday's action aborted some of those signals. 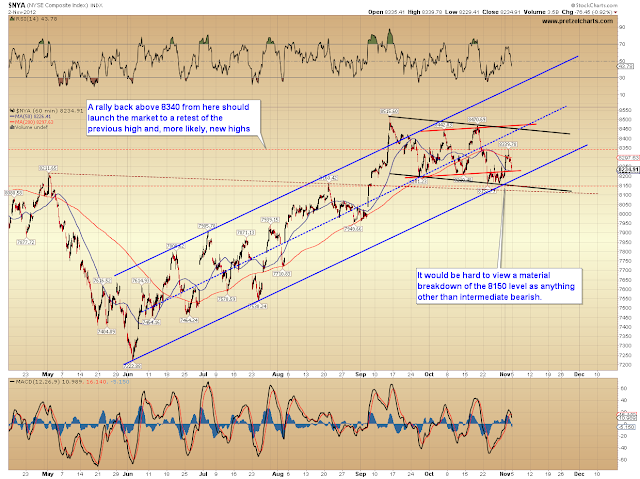 Hourly MACD on the S&P 500 (SPX) flipped to a sell signal, and several markets formed very bearish reversal candles. The good news is my short-term target from Wednesday (of 1430-1432) was reached before the market reversed, capturing 20 SPX points of profit. The bad news is the intermediate-term outlook has been clouded by the strength of Friday's reversal, and bulls will need to reverse the market directly to maintain their hopes. Trade below 1403 SPX would suspend the potential intermediate turn I talked about in Friday's article. 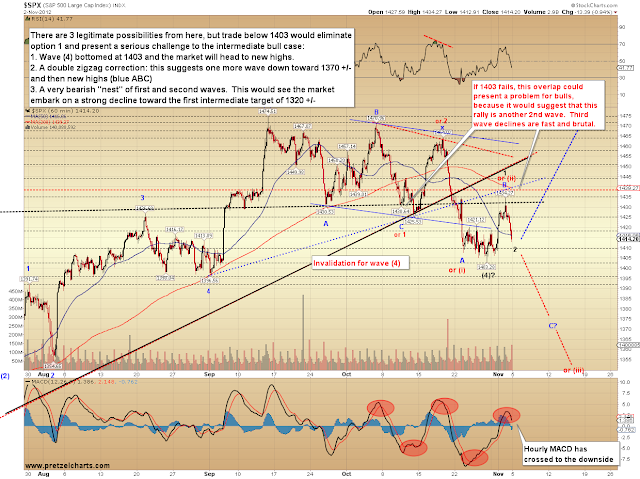 The chart below outlines the three viable wave potentials from here. The reality is: at this point, if the market crosses back below 1403, that will tell us more about what this wave structure isn't than about what it is. 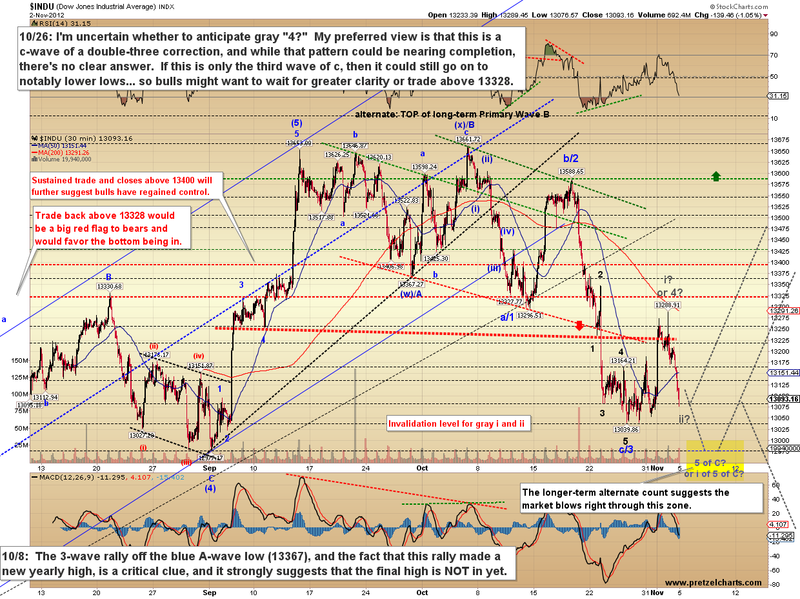 As noted, trade below 1403 would invalidate the wave (4) bottom and open up the possibility that this decline could have much further left to run -- though it's difficult at this point to say exactly how much farther. The old expression "the trend is your friend" would be wise to keep in mind if this happens, as trade beneath 1403 would indicate the intermediate trend is still down. The wave count discussed on Friday of a fourth wave bottom at 1403 is still the best fit to the entire structure, so if bulls can hold 1403, they give themselves a fighting chance at making new swing highs directly. Trade above 1423.62 is the first short-term step for bulls to start feeling good again, and trade back above 1434 would be a confidence booster. 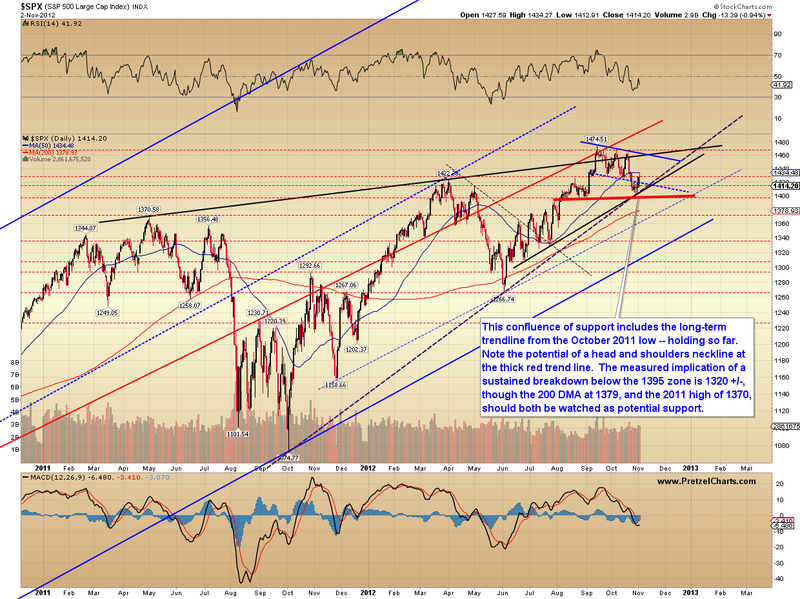 On the bearish side of the coin, the SPX trendline chart notes a potentially dangerous pattern for bulls if the market sustains trade beneath the 1395 zone. 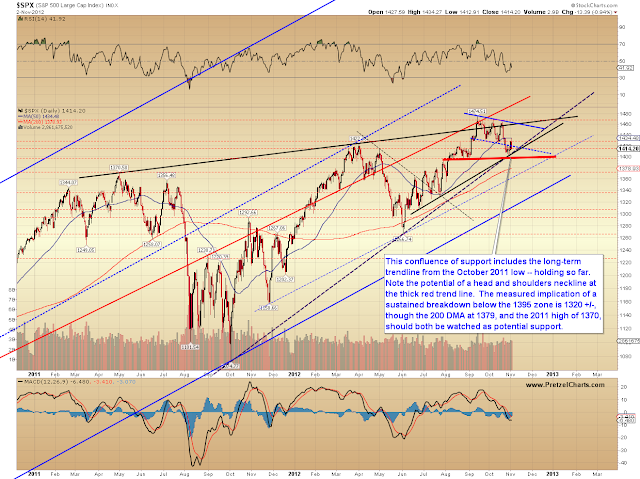 Trade into that price zone would also break the long-term uptrend line of the past year. It's interesting to contrast the NDX chart shown above with the NYSE Composite (NYA) shown below -- NYA is still maintaining its intermediate uptrend since June of this year. The fractured pictures across markets continue to create analytical challenges. The Dow Jones Industrials (INDU) allows the potential of a fifth wave (the final wave of a decline or rally) lower without turning the picture horribly bearish... though such a decline could mark wave i of 5 or similar. 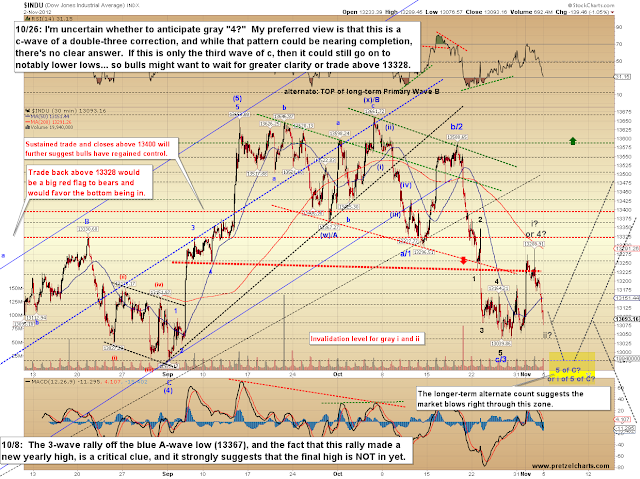 In conclusion, Friday's strong reversal lower created some questions about the intermediate outlook -- but until 1403 is claimed, the bullish wave count discussed in Friday's article is probably still the best-fit for the overall pattern. 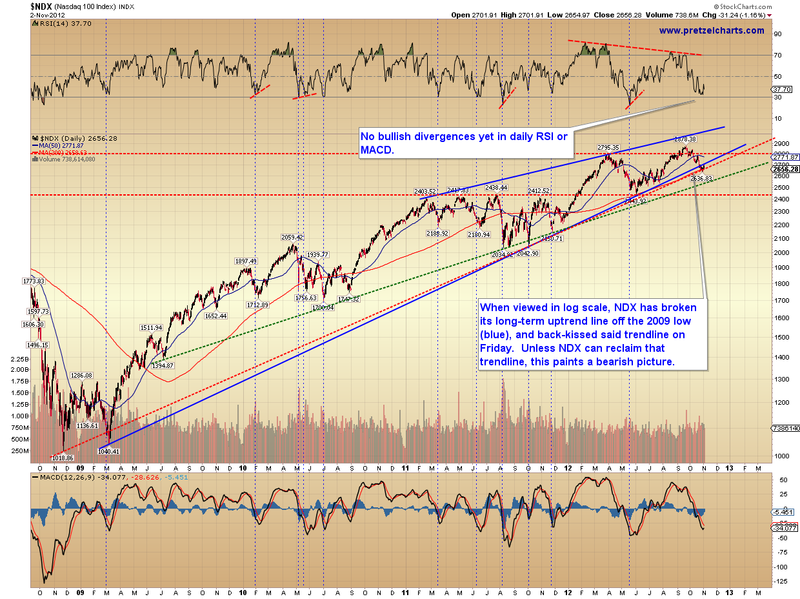 The strong caveat here is that trade beneath the recent swing low of SPX 1403 would necessitate extreme caution from bulls, particularly those who ignored the earlier warning signs noted in these updates. The picture should clarify this week. Trade safe.